Truth is, I always wanted three kids. I'd hoped with my three kids, I'd have at least six grandchildren. 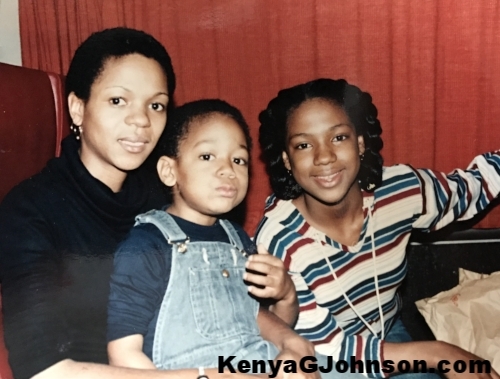 With six grandchildren, I'd hoped to have twelve great grandchildren, and I'd hoped to one day be the matriarch of the family in Charlotte, North Carolina, where we had established our roots. I'd hoped to have cookouts with my family, attend everyone's everything, and spend holidays with everyone without having to travel. Vacations for my family happened in the summer as we traveled by train to see our relatives. Time with family for any other ocassion fell under the umbrella of weddings and funerals. When I grew up, I didn't want to see my entire family for just weddings, funerals and one-week summer vacations. When I grew up, I was going to take real vacations to vacation kinds of places and see my family whenever I wanted to. I met and married Papa Bear and easily adapted to being a military spouse, living far away from home because I always had. Traveling would be a repeat of what it had been for me in my childhood. It would be fifteen years before we'd call Jacksonville, North Carolina our permanent home. Having just one child came later than I'd hoped and two more never happened. The reality of creating a new generation of family and establishing roots in one place now falls in the hands of my twelve-year-old son. By the time I think it would be a reasonable time for my baby boy to start a family of his own, I'll be 64 years old. Add just one grandchild at a reasonable time to start a family, and I'd be 94. Boy, talk about getting yourself in the sorry box. It sounds selfish and ungrateful talking about how my life is different from how I imagined it would be. But I dredged up some sad feelings and here I am. Maybe things aren't so wonderful for people who have their whole families in one town, but I imagine that it is. I get sad about there being weeks, months and years passing by without seeing one another. When you leave and say goodbye, there is no "see you tomorrow". When everyone gets older, leaving and saying goodbye gets harder. You don't know when the next time will be; I'm not always optimistic that there will be a next time. It won't be at Sunday's cookout. It may be at a funeral. 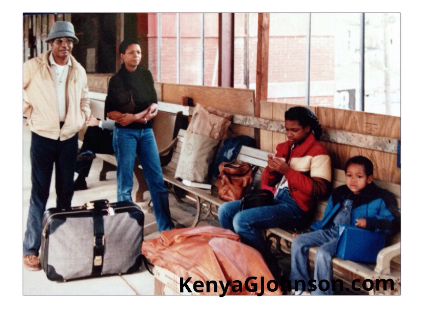 When it comes to traveling, I think about our one-week summer vacations when we boarded that Midnight Train to Wilmington, Delaware from Columbia, South Carolina. When I looked at the date of these and flipped back to look at the pictures, as an adult, I connected with my mom from that December 1982. My grandmother was sick and there wouldn't be a next time. There would be a funeral. Mom's body language expresses that she's just holding on. I feel her pain. I thought I was fine to share a happier and nostalgic piece about our train rides. But I saw something in the pictures that I'd hadn't connected with before. After looking at the date, I felt sad for mom. Two months later, she would board the midnight train to Delaware, arrive in a snowstorm, and get there just in time to say goodbye. So I cried for her. In the words of Forrest Gump, "That's all I have to say about that."